The BlackBerry KEY2 LE delivers important discretion and privacy are at your fingertips, enabling you to manage how personal information is shared. BlackBerry’s Locker app gives you the power to instantly store and protect photos, conceal apps and files, keep sensitive data under your control and take advantage of Firefox Focus™ private browsing. Use the built-in DTEK™ privacy monitoring app, privacy screen, and monthly security updates from Android. 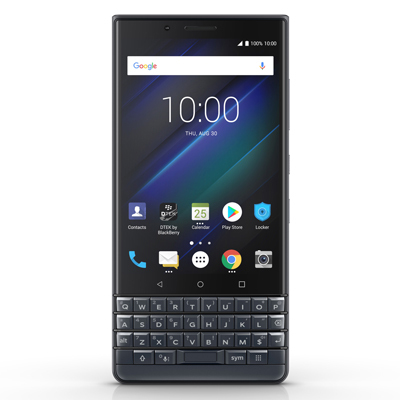 Increase productivity with full QWERTY keyboard, Speed Key, customizable 52 shortcuts to instantly access your frequently used apps, and BlackBerry® Hub which brings all your messages into one consolidated place. The BlackBerry KEY2 LE offers dual account management built in, to enable you to separately manage both personal and professional social media profiles on apps like Facebook, and Instagram. Crafted with a lightweight polycarbonate design and a newly designed soft textured back covered that provides great feeling in hand and less likely to drop. The fingerprint sensor is integrated with the space key for easy ergonomic access and will enable quick access to unlock your phone or access content in the Locker app. Powered by Android TM 8.1 Oreo with access to millions of apps in the Google Play™ store and built-in Android experiences like Google™ Assistant and Google Lens™. A powerful combination of a super efficient Qualcomm® 636 Snapdragon processor and 3000mAh battery keeps you powered through a full day and often into a second day of use (22 hours of mixed usage). A contextual battery reminder ensures the BlackBerry KEY2 LE will learn from your daily charging habits and calendar appointments to recommend when to charge. Qualcomm Quick Charge® 3.0 enables up to 50 percent charge in just 36 minutes. Turbo charge your battery and get power fast, to do more, when you need it most. Be business ready with BlackBerry® Secure™ Android mobile experience, including Hardware level security, vulnerability mitigation and hardened Android container for out of the box EMM integration without additional costs or licenses. Part of the Android Enterprise Recommended (AER) program which helps you cut down on support costs and spend less time deploying and servicing devices. Zero-touch enrollment allows IT to deploy corporate-owned devices in bulk without manual setup. Capture the moment on the dual main camera with dual colour flash (13MP +5MP), HDR, up to 4K video recording at 30 fps, Scan, Private Capture, Portrait (bokeh) and improved camera software tuning for better image quality. Snap the perfect selfie on the 8 megapixel front camera with selfie LCD flash with Portrait mode and built in filters enhancements.